We’ve all heard at some point that good hand washing practices are needed for protection against diseases and to live a healthy life. However, hand washing is still not seen as a priority by many. In fact, most people would not bat an eyelid at someone who doesn’t wash their hands as often as possible. To a lot of people, it doesn’t really matter. Forming the habit of washing our hands regularly is one of the most effective ways to protect one’s self from contacting and spreading infectious diseases. Parents and teachers are expected to make efforts to teach children the benefits of washing their hands to prevent the spread of germs and bacteria. 1. Practicing proper hygiene and cleanliness. All the surfaces and objects we touch with our hands are covered with germs and bacteria. Washing our hands helps get rid of them. 2. Prevention of diarrhea and other bacterial diseases. Among many diseases that can be contacted through dirty hands, diarrhea is one of the most dangerous of them all. This disease which can be contacted through your hands can lead to death. Rotavirus is one of the deadliest diarrhea disease-causing agents. 3. It promotes social etiquette and grooming. Shaking hands with people is a big part of socializing and doing so with a dirty hand creates an awkward situation between the parties involved. 4. Protection against food poisoning. Handling food with dirty hands could contaminate the food and lead to food poisoning. This could create an intestinal infection that might become deadly. 5. Saving the cost of going to the hospital. Washing your hands and those of your children and wards can save you the time, money and inconvenience of going to the hospital. 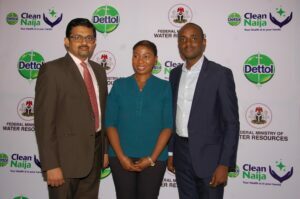 To ensure that proper hand washing habit is encouraged among Nigerians, Dettol has partnered with the Federal Ministry of Water Resources to launch the ‘Clean Naija Program’. The aim of the initiative is to create awareness and educate the public on the importance of handwashing in order to achieve a cleaner and healthier Nigeria. The MOU signing for this initiative held on Thursday, March 14, 2019, in Abuja. 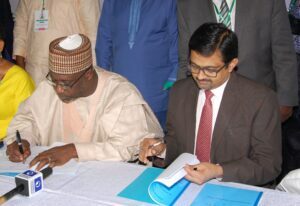 L-R: Minister of Water Resources, Suleiman Hussein Adamu, with the General Manager, RB West Africa, Dayanand Sriram, during the MoU signing between Dettol and Ministry of Water Resources on Thursday, March 14th, 2019 for Dettol Clean Naija Program Launch in Abuja. 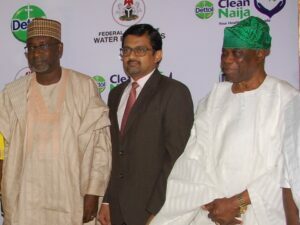 L-R: Minister of Water Resources, Suleiman Hussein Adamu, General Manager, RB West Africa, Dayanand Sriram; Chairman, RB West Africa, Chief Olu Falomo, during the MoU signing between Dettol and Ministry of Water Resources on Thursday, March 14th, 2019 for Dettol Clean Naija Program Launch in Abuja. L-R: General Manager, RB west Africa, Dayanand Sriram; Brand Manager, Purposeful Marketing, RB Nigeria, Cassandra Uzo-Ogbugh, and Category Manager, Health, RB Nigeria, Bayode Akanbi, during the MoU signing to flag off Dettol Clean Naija Program in Abuja on Thursday, March 14th, 2019.